For people who are limited in their means of mobility, an alternative known as the battery powered wheelchair has been invented. You must be aware of its importance but in case if you didn’t, let’s give you a tour of the history of wheelchairs and how they were evolved into battery powered wheelchairs. As already mentioned above, wheelchairs have been introduced in the late 1500s. It was a simple one which needed help with the mobilization. They say that the first wheelchair was made as an experiment but it gained popularity as soon as it was released. However, another person had to help in moving it over. Fact: The first wheelchair was actually invented for Philip II of Spain in 1595 by an unknown inventor. Later on, in 1655 Stephen Farfler made or basically evolved it into a self-mobilized wheelchair. Before this, you would need assistance in moving your chair about. It was a three wheel based chair which you could move along the direction you wanted to go at. In the late 1700s, another evolution occurred and was named as “the bath wheelchair”. This happened around 1783, John Dawson of Bath, England made a chair and named it after his town. It had to large wheels at the back and a small one at the front. For the time being, this chair became famous among the community. The bath wheelchair was claimed to be very uncomfortable by many. So in the 1800s, small improvements were made like adding rubber to the wheels for self-propulsion, tweaking in with the seats and all, etc. Safe to say that 1800s gave way to creating good wheelchairs. In the first phase, the wheelchair was given seats, and rotation power. So if you wanted to move about or turn around, it would be easy to do so in such tubular rotating chairs. In the second phase, the very first powered wheelchair was introduced. Not exactly like the batter powered wheelchairs in usage nowadays but enough for you to just move about with controls. In the third phase, the first steel wheelchair was introduced which you can even see in usage nowadays. It was invented by Harry Jennings. As soon as an entry into the 2000s was made, the wheelchair continued to evolve and go through maximum transformations. First, the controls were made battery powered. Then extra tweaking was added when you could relax your head or feet or compel the chair to let you stand and other such things. Slowly, sensor installed chairs were introduced which are still in practice and some are already available in the markets. They allow your mind or your chin to control the movements of chair. 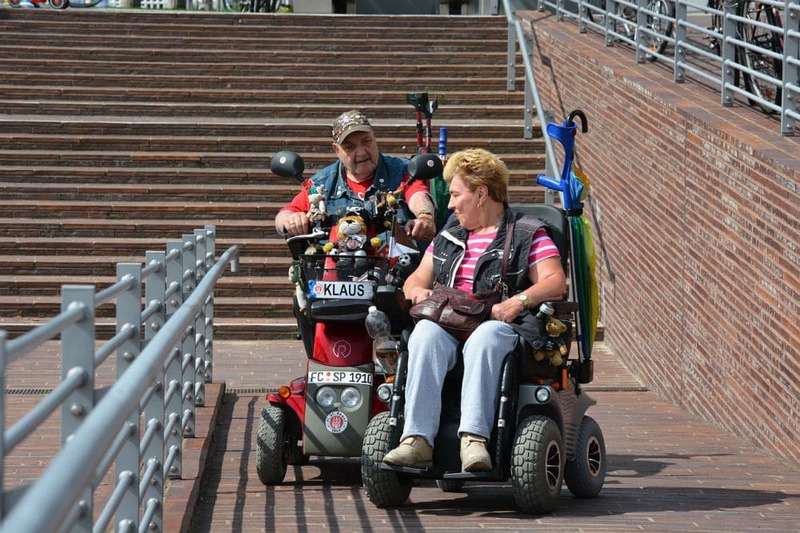 These kind of battery operated wheelchairs are for those who have very limited mobility.